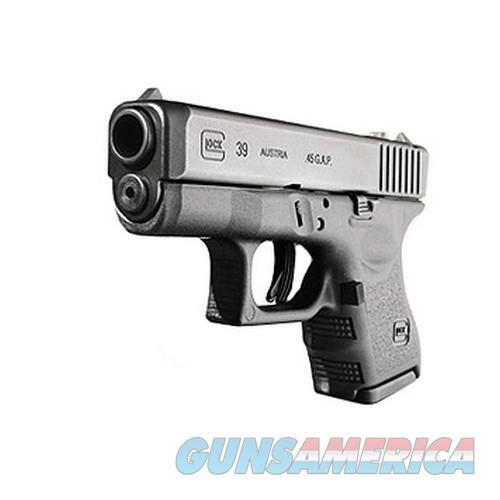 Description: Built around the design parameter of GLOCKs subcompact models the GLOCK 39 melds deep concealment size with the power and accuracy of the .45 G.A.P. cartridge. This pistol can be considered the GLOCK for the master shooter who wants perfection in a small, powerful package.Specifications:- Gen 3- Caliber: .45 G.A.P.- System: Safe Action- Weight: 548 g / 19.33 oz. LOADED () 718 g / 25.33 oz.- Length: 160 mm / 6.30 in.- Height: 106 mm / 4.17 in.- MAG. Capacity: Standard: 6- Width: 30 mm / 1.18 in.- Barrel Height: 32 mm / 1.26 in.- Trigger Pull: 2.5 kg / 5.5 lbs.- Trigger Travel: 12.5 mm / 0.5 in.- Line OF Sight: 144 mm / 5.67 in.- Barrel Length: 88 mm / 3.46 in.- Barrel Rifling: right hand, octagonal- Length OF Twist: 400 mm / 15.75 in.